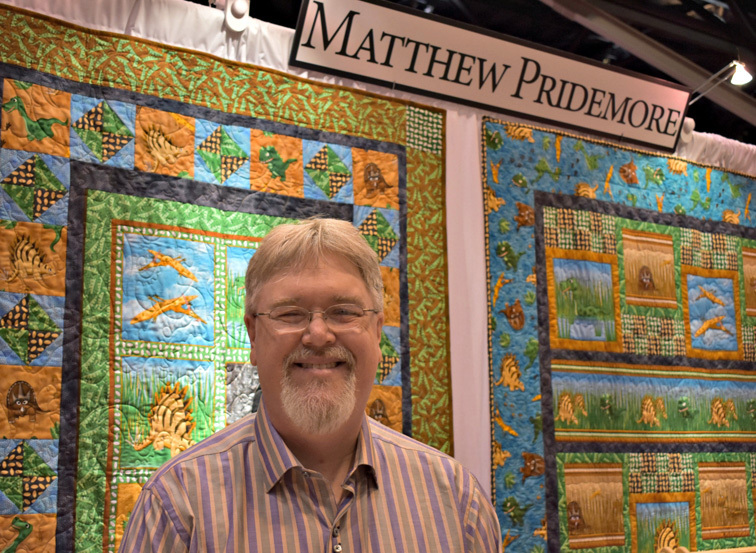 We're back from Spring Quilt Market with plenty to show! 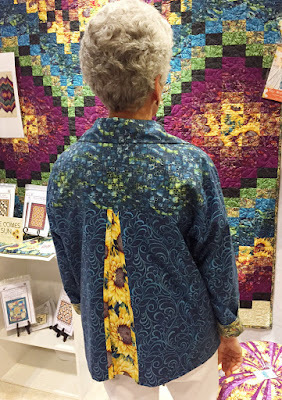 We'll be splitting the photos into three days of posts. 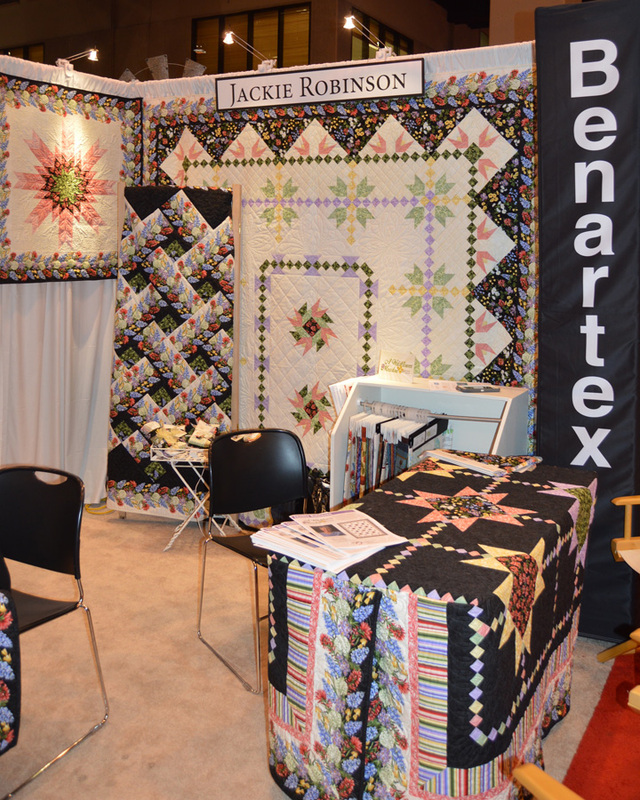 Today you'll see the booth displays and new collections from Ann Lauer, Matthew Pridemore, and Jackie Robinson. 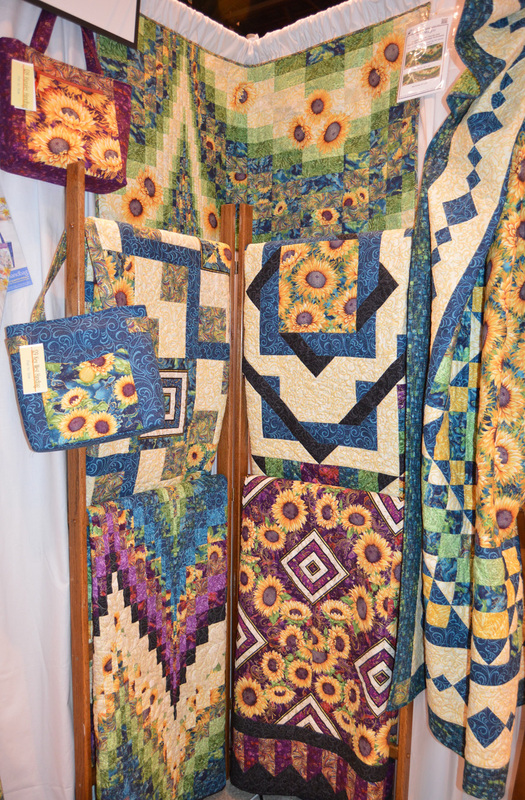 Here's Ann's booth, featuring her new line, Here Come the Sun (hello, sunflowers!). 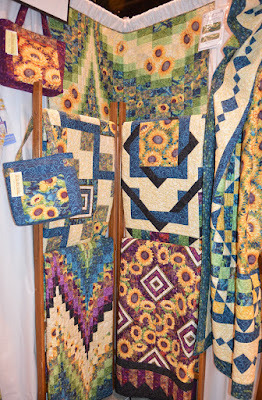 Sunflowers are abloom all over--in both Ann's quilt patterns and bags from Pink Sand Beach Designs. 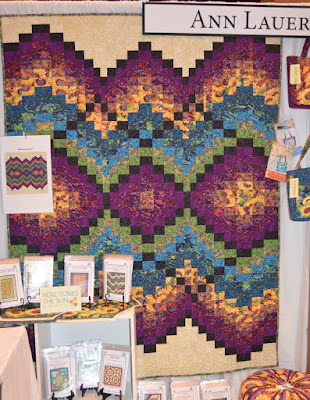 The showstopper--a free quilt pattern for Here Comes the Sun. Sunflowers peeking through in the back. 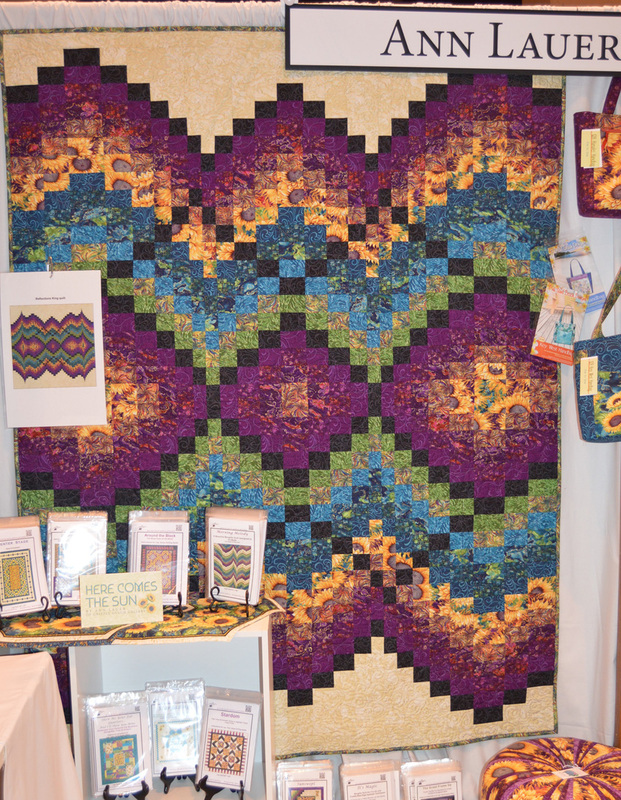 Click here for a sneak peek at the Here Comes the Sun collection, available in quilt shops in the fall. Next up is whimsical fun with Matthew Pridemore's Dino Age collection. "Friendly Little Dinosaurs" is a free quilt pattern available on our website. 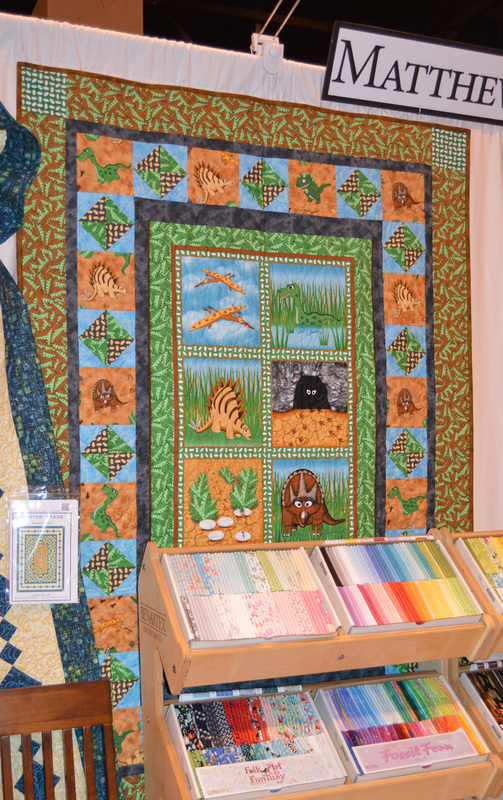 This quilt uses the Dino Age panel, surrounded by a variety of pieced borders. 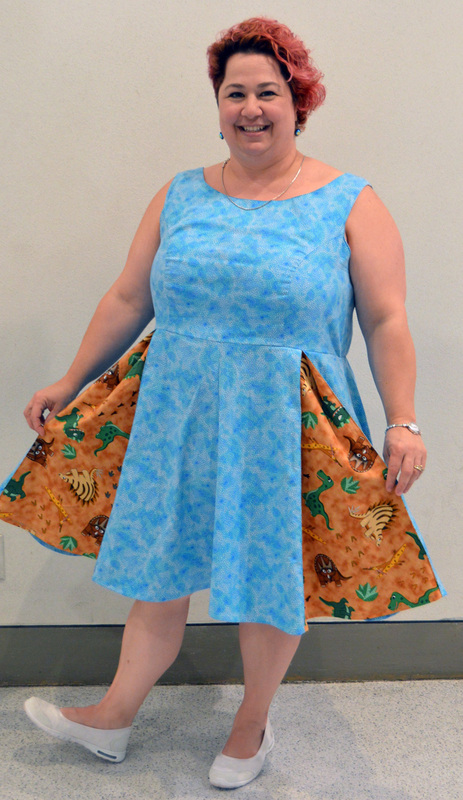 Even Matthew's wife, Heidi, got into the fun, modeling a dress she made using the Dino Age fabrics! 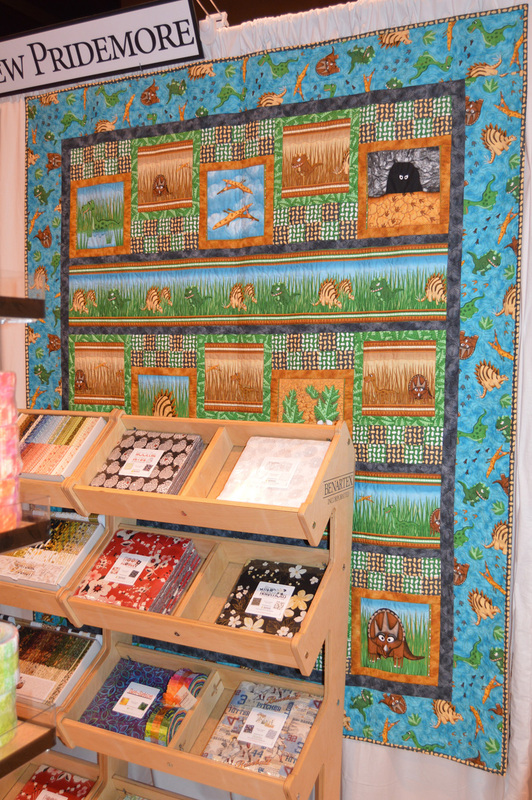 Click here to see the entire Dino Age collection, available in quilt shops now. 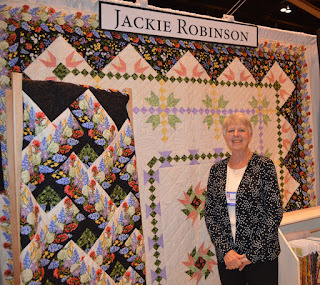 Our third booth display to show today is from Jackie Robinson, called A Wildflower Meadow. The collection features Jackie's signature stripe, wildflowers, and plenty of coordinates! 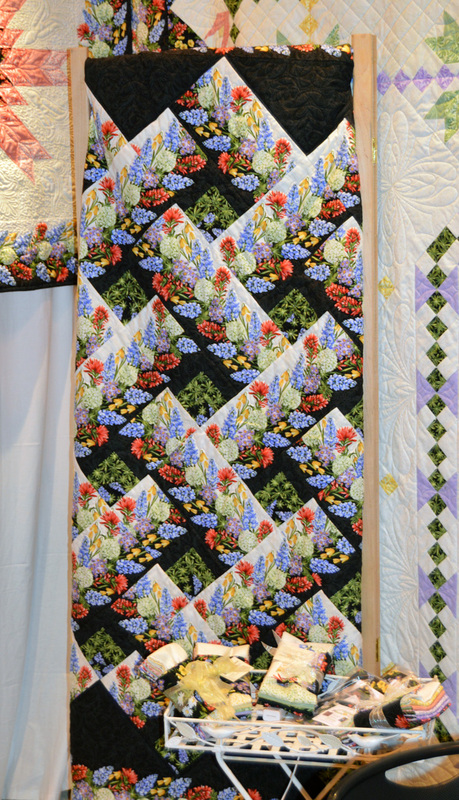 This quilt looks complex, but all the work is done by the stripe. 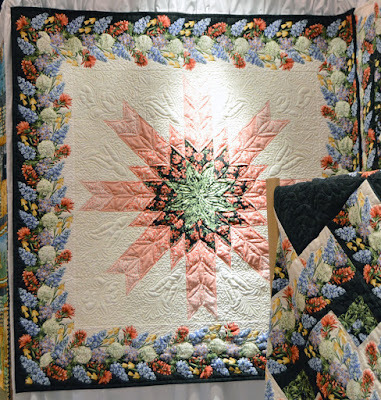 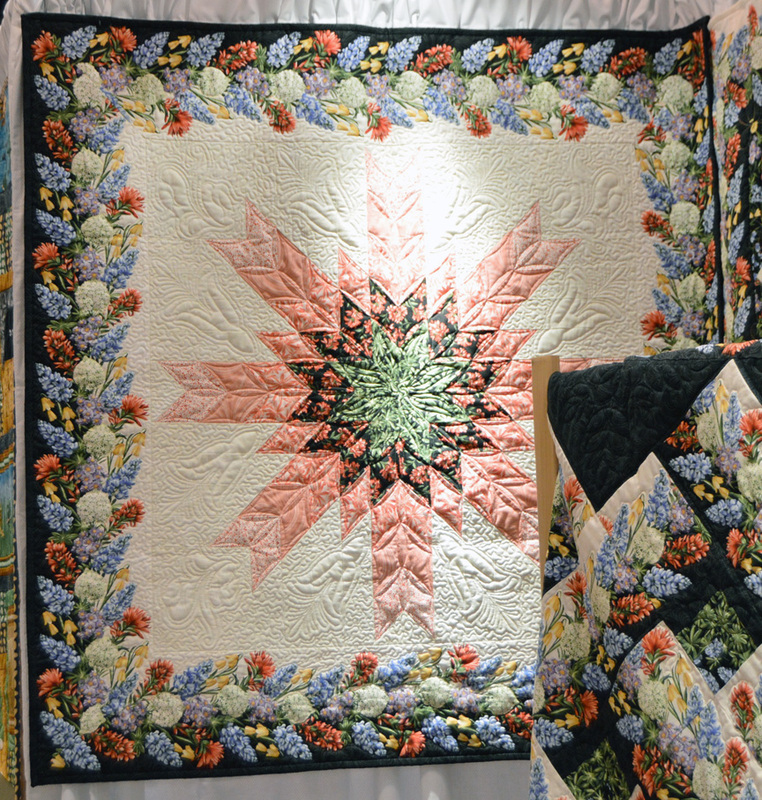 A medallion quilt surrounded by the floral stripe. Click here for a sneak peek at the entire A Wildflower Meadow collection, coming to quilt shops late summer. 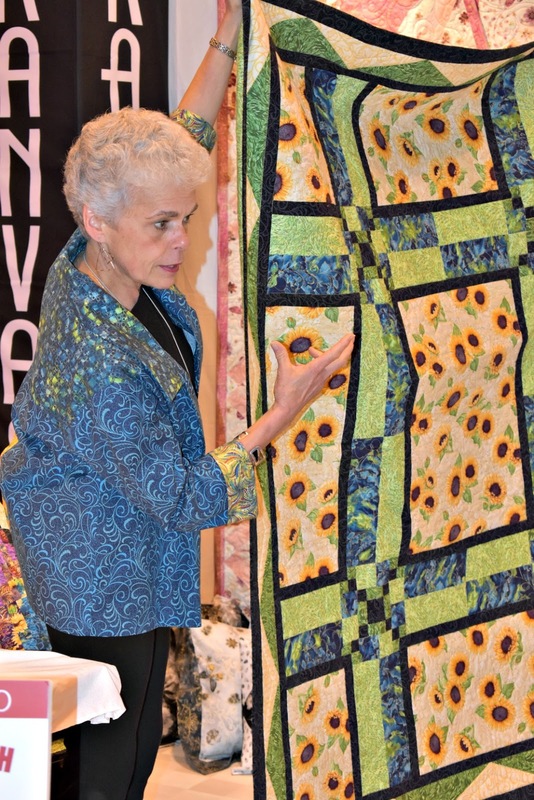 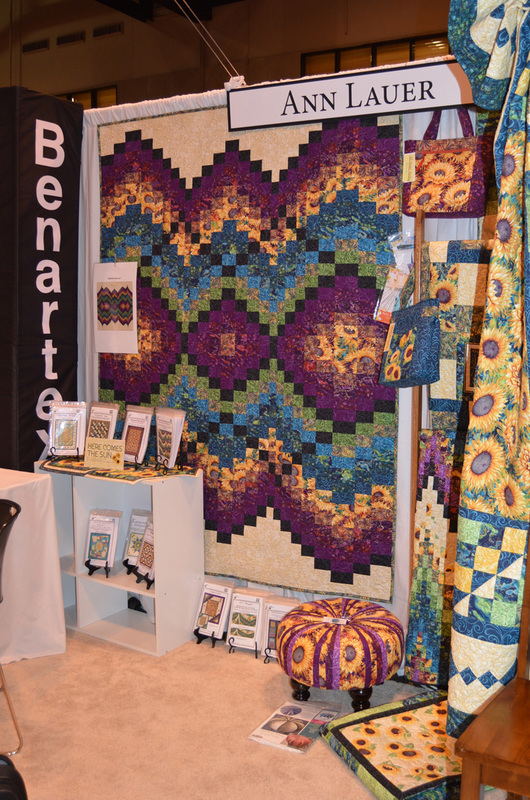 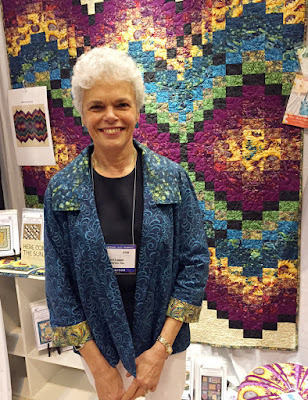 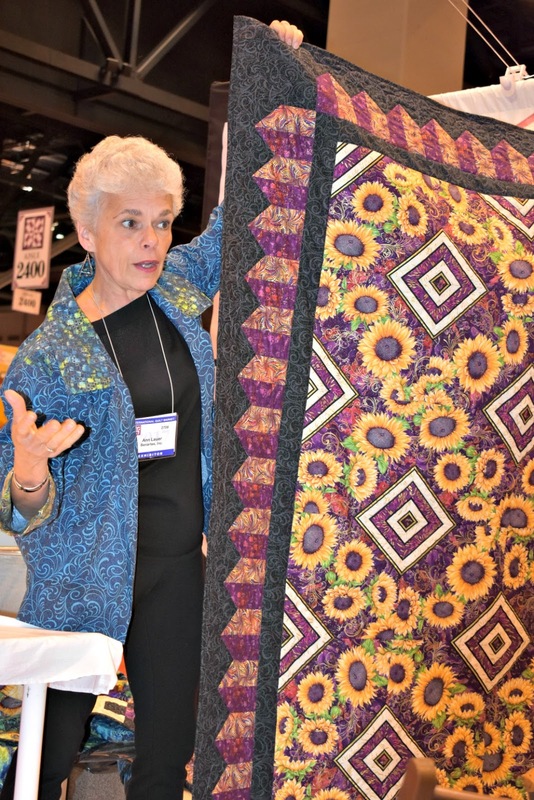 Did you catch the first day of our Quilt Market booth tour? Stop by tomorrow to see more of our Quilt Market booth. Love Ann Lauer's booth sunflowers and her jacket!